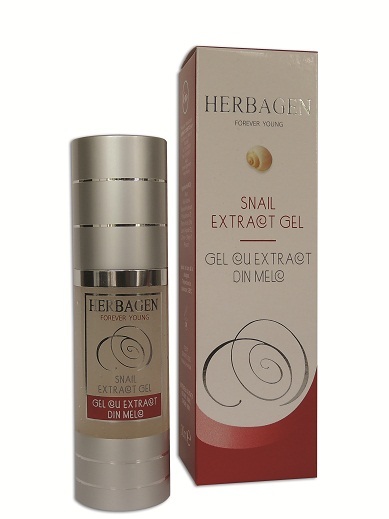 Herbagen Snail Repair gel – 30 ml. Product that restore damaged tissues. Does not contain PARABENS, PARAFFINS, colouring agents, silicones, sulphates (sls) or perfume. The gel has a composition of 97% substances of natural origin and is especially reccomended for acne type skin. Contains Polyhelixan, a powerful natural and ecological ingredient, obtained from the secretion of the Chile originated garden snail Helix Aspers. Polyhelixan’s composition is extremely complex: alantoin, proteins, A, C, E vitamins, alphahydroxiacids, mucopolysaccharides, proteolytic enzymes, collagen and elastin. calming and healing inflammations which may appear due to acne, light burns or recent wounds. hydrating and increasing skin elasticity by activating the secretion of collagen and elastin. Daily care, morning and evening. Apply on cleansed face neck and decolletage. Massage gently with circular movements to help the cream’s better absorption. Contains Garden Snail Extract. Product is dermatologically tested. No animal testing.